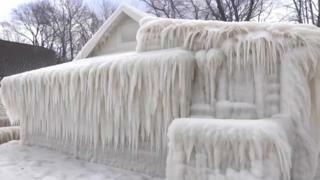 Cold weather in New York state left one house completely encased in ice. The home, on the shore of Lake Ontario, was captured by a local photographer after being battered by water whipped up from the lake by freezing winds. The photographer said many people on social media refused to believe the images were genuine. John Kucko said he was "amazed at how many people think I sprayed foam on the place" and posted video footage as proof. He said he found the house after being "tipped off" by a local and "was on a mission to find the place before sunrise." A frigid windstorm last week in western New York was strong enough to knock out power to over 200,000 people. Over 8,000 were still without power by Monday morning. Why did people assume an Asian woman in BBC viral video was the nanny? New York state remains subject to a blizzard warning from the US National Weather Service, with 12 to 20 inches of snow expected in New York City and surrounding areas on Monday and Tuesday. The heaviest snowfall is expected to come on Tuesday morning when it will fall on the city at rates of 2 to 4 inches per hour. Blizzard warning are also in place along much of the East Coast, as people brace for the so-called Nor'easter storm. Major cities from Boston to Washington DC are forecast to receive several inches of snowfall, which comes only one week after unusually clement weather. Last month was the second warmest February on record since record-keeping began in 1895.